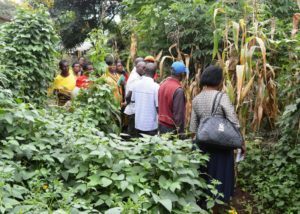 With the help of a Peace Corps Volunteer, a group of farmers from Mzimba in the north of Malawi pooled their personal resources and funded a trip to Never Ending Food. They traveled to Lilongwe and received a tour of the Parliment building where they also got to meet with their Member of Parliament. The next morning they visited Child Legacy, a large hospital which has been implementing Permaculture for several years, and then they spent the afternoon with us here at Never Ending Food. It was a wonderful visit with highly motivated participants. We were able to show them a wide variety of ideas for the implementation at the household, as well as the community, level. As a treat, we made the group a cake and juice made with from the flour of the fruit of the Camel Foot tree (‘chitimbe’ or ‘chisale’, Piliostigma thonningii). 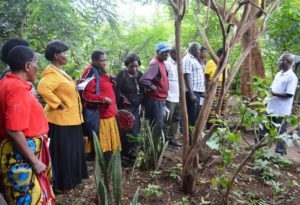 The group was particularly interested in the worm farming and composting toilet systems. They also seemed to appreciate all the different ways that we use to feed the soil without the use of chemical fertilizers (e.g. mulching, compost, liquid manure, nitrogen-fixers, etc). When the participants left, they said that they were extremely excited to get home and start implementing many of the things they had learned. We wish them all the best of luck! !